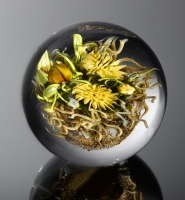 Paul Stankard is one of the most prestigious and world-reknown glass artists, famed for encasing his extremely delicate sculptures of flowers and insects in globes or cubes of clear glass. He is the recipient of numerous awards and holds two honory doctorates. Stankard’s work has shown across the United States and Europe and in Japan and Taiwan. 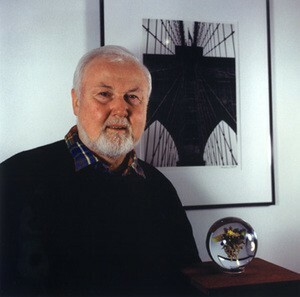 He is currently a Fellow at the Corning Museum of Glass and serves as a founding board member of the Creative Glass Center of America in Millville, New Jersey. “As an artist who has worked with my hands in glass for 35 years, the line ‘the narrowest hinge in my hand puts to scorn all machinery’ continues to amaze me. And the native flowers he chose to write about like pokeberries and common mullein are easily overlooked, ordinary. He speaks of the ant’s perfection, the egg of a wren.